Anacortes, Wash., man opted into UW Medicine protocol to receive infected donor heart and then had virus eradicated. 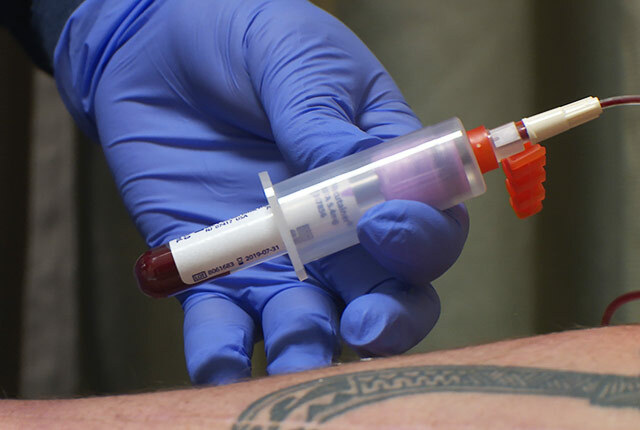 Kerry Hayes estimated that he's had more than 30 blood draws post-transplant to monitor hepatitis C.
Kerry Hayes, 49, of Anacortes, Washington, was deemed clinically cured of hepatitis C (HCV) on Dec. 20 after a blood test detected no viral load. He had acquired HCV during a transplant July 3, 2018, at UW Medical Center in Seattle and subsequently completed an eight-week course of daily antivirals. After waiting 17 months for a donor heart, Hayes opted into the HCV donor-heart protocol and received an offer two weeks later. Last summer, UW Medical Center formalized a transplant protocol to increase the viability of hearts from HCV-infected donors. Typically such organs are discarded unless they are a match for transplant candidates who already have the virus. Only a fraction of U.S. transplant centers make such use of organs. The HCV heart protocol is the only one of its kind in the Pacific Northwest, according to LifeCenter Northwest, the region’s organ-procurement agency. Currently, 30 to 35 heart-transplant candidates are on a waiting list at UW Medical Center. Each is given a thorough explanation of the HCV protocol and, at multiple junctures, given the opportunity to accept such an organ if a match becomes available, explained Jason Smith, the cardiothoracic surgeon directing the protocol. Hayes with his daughter, Kortney, left, and wife, Kristy, at UW Medical Center in October. Hayes, an oil refinery worker, had lived with an underperforming heart for more than two decades. At age 28, he underwent the first of five open-heart surgeries. In early 2017, UW Medicine cardiac specialists recognized that his heart, despite earlier repairs, was failing. Hayes’ health was so dire that they implanted him with a total artificial heart, a high-tech device that keeps blood circulating and is powered by a percussive external pump. The device is a bridge to transplant for people who would likely die without it. The device kept him going for 17 months – about a year longer than most UW Medicine patients wait for a donor heart. Hayes was grateful to be alive but said it was emotionally harrowing to wait so long for a match while being tethered 24/7 to the machine. Just two weeks after Hayes consented to be considered for a HCV-donor organ, the call came with a matching organ. There was no doubt about accepting it, he said. The transplant went smoothly, and tests showed he developed HCV within two weeks of the transplant. On Aug. 4 he started the eight-week course of the antiviral Mavyret. Drs. Jason Smith and Renuka Bhattacharya helped formulate UW Medicine's HCV transplant protocol. Hayes was cooking dinner Dec. 20 when got a phone call from Renuka Bhattacharya, the liver specialist overseeing his post-transplant care. She said his most recent blood draw detected no HCV and that Hayes had achieved a 12-week “sustained virologic response” to the Mavyret. He was cured. “My wife was out, so I was alone. I sent a text to my whole family – my kids and brother and sisters and my mom,” he said. Hayes’ outcome suggests that the antivirals can be well tolerated by heart-transplant recipients, Bhattacharya said. “We didn’t see significant interactions with the anti-rejection meds.” Additionally, UW Medicine’s liver-transplant program just had its first patient complete the HCV protocol, with similar success, she said. If a patient's first round of antivirals does not eradicate the HCV, the team would re-treat with a longer course, Bhattacharya added. It was more than two years ago, as the HCV curative regimens were becoming more readily available, that Smith, Bhattacharya and colleagues started discussing an expanded use of infected donor organs. Devising a protocol meant addressing myriad what-ifs. Stakeholders in cardiac surgery, transplant and liver-care services needed to feel very confident about patient safety. And it was unknown whether insurance would cover the antivirals, which in 2016 cost upward of $80,000 per patient. Those prices have dropped considerably, making the protocols viable. “Now it’s just about spreading the word to organ-procurement organizations around the U.S. that we’re willing to take HCV-positive donors,” Smith said. UW Medical Center could see as much as a 10 percent increase in transplants because of the new protocol, he estimated. For patients like Hayes who are wait-listed for a heart transplant, the benefit of an increased donor pool is obvious. But there is also an upside for the families of intended donors whose organs have, in the past, had no chance of transplant because of hepatitis C.